The MLB draft is scheduled to begin on Thursday June 5th and since it is just around the corner, now is a good time to talk about what the Reds should do with the 7th overall pick. At this point, it looks very unlikely that the Reds will get a shot at high school shortstop Tim Beckham or stud Vanderbilt 3b Pedro Alvarez. In addition, the Reds likely won’t pursue high school 1b Eric Hosmer, as he is asking for a $7M contract and the Reds have recently put an emphasis on prospects who play the premier defensive positions. Given that the Reds tabbed Devin Mesoraco with their first pick last year, Florida State catcher Buster Posey is unlikely as well. As for the rest, well, just started taking a look at some of these guys and right out of the gate I'm really not sold on Brian Matusz. He's rated #3 by Baseball America, but I have a few concerns. He's a tall lefty, but I'm not sold on his mechanics. He seems to throw almost exclusively with his arm, as he doesn't coil his body on the leg kick to store up energy and he throws pretty upright, which makes it difficult to generate much leg drive. In addition to being rather upright, he looks fairly stiff in his delivery. He strikes me as an injury risk, because he doesn't incorporate his body into his delivery very effectively. University of Missouri right hander Aaron Crow is rated #5 by Baseball America. His mechanics are pretty clean and his stuff looks very impressive, but I do see a bit of Mark Prior type arm action in him, which makes me a tad nervous. He gets his elbow up a bit too high after breaking his hands, which leads to a higher stress whip like arm action coming through, especially with his live arm. That could put extra stress on the arm, but he's got a live arm, good stuff, and the rest of his mechanics are clean. I do like him much more than Matusz, but for me, there is a bit of a red flag on him. Still, he looks like a #1 starter, IF he can stay healthy. But, how big is that IF? Tanner Sheppers was rated number 9 by Baseball America, but unfortunately he drops out of the running after questions surfaced about the health of his pitching shoulder. Shooter is intriguing and I like his mechanics a lot. He's got a very high, over-the-top delivery. He's got very good stuff and his stats rate equal to, if not favorably with, Crow's. Still BA ranks Crow #5 and Hunt #11. He uses a 91-96 mph fastball and has a power curve. In addition, he's got very strong mound presence. His command hasn't been as good as some of the other top prospects, but while his command needs work, it certainly isn't a huge flaw. All in all, I like what I see from Shooter a great deal and he could develop into a top of the rotation starter. In addition, it's hard to imagine a better name for an MLB pitcher. "Gimme the Shooter!" Friedrich was rated #15 by Baseball America. He seems solid from a mechanics standpoint, but if it's true that his ceiling is that of a #3 starter, then he never enters the discussion in my mind. If we can't find a player with a better upside with the 7th pick than that, then we should just close up shop now. Gordon was rated #8 by Baseball America. Watching Gordon hit makes me wonder how well his offensive game will really transfer to the pros. He's got surprising power for his size and he demonstrated good power in the Cape Cod league with a wood bat. Even so, I'm not sure I really buy into Beckham. I'm not sure that his arm or range are really all that impressive, but he should be a solid offensive player. He strikes me as being an Aaron Hill type player, which wouldn't be too shabby. In addition, from what I've read, he's got good intangibles and is a real blue collar type player. I like University of South Carolina Justin Smoak's swing and offensive game, but I'm just not sold on taking a 1b and given our recent preference for premier defensive positions, he seems an unlikely choice. The other name that does intrigue me is one that has been linked to the Reds. I'm sure some will roll their eyes on this one, but I must admit, Casey Kelly really intrigues me. I know he's been talked about as a reach, but I do give extra points for an MLB pedigree. It's not fair to the rest of us, but genetics does play a big part with these legacy type players and his father, Pat Kelly, did have a cup of coffee at the MLB level. Casey is an impressive athlete and he should have no difficulty staying at short in the professional ranks. Despite his 6'4" height, Kelly is graceful with very good range and a plus arm. Kelly had a good high school season, but questions still linger over his bat. In addition, Kelly would have to be convinced not to go to University of Tennessee to play quarterback. Still, the Reds would have an advantage, as Pat Kelly manages the Reds Rookie League Gulf Coast Team. BA rates him as the 19th best prospect, but here's a guy who is a legitimate shortstop prospect and could grow into a strong offensive player to boot. SO, WHO SHOULD WE TAKE? For me, I've got it narrowed down to Aaron Crow, Shooter Hunt, Gordon Beckham, and Casey Kelly. To pare it down a bit further, here's where I stand. Crow's mechanics give me a slight red flag for injuries, so I'm going to bump him down the list. I think Shooter Hunt has better mechanics and suffers only from a very slight, if at all, downgrade in pure stuff. Both have projectible frames and good stuff, but Hunt seems a slightly lower injury risk. As for Gordon Beckham, I love his attitude and intangibles, but I don't see him sticking at shortstop. His bat should play well enough at 2b, but I'm not looking for a 2b. So, I'll move Gordon down the list. Once again, this brings us back to Casey Kelly. I must admit, Kelly really intrigues me. I love the way he moves in the field, he has good size, a smooth swing, and a plus arm. Unfortunately, the Reds lost their 2nd round pick for signing Coco Cordero, so that makes it more difficult for the Reds to justify the increased risk of Casey Kelly. So, for me, it comes down to Shooter Hunt and Casey Kelly, both of whom I rate highly. I'm taking Casey Kelly. His defense should translate well to the professional game and his bat could make him an electric player. He is undoubtedly a bit of a risk and I don't usually favor high school players, but Kelly could be the shortstop that we've been seeking since Barry Larkin retired. If the first six picks include Tim Beckham, Pedro Alvarez, Brian Matusz, Aaron Crow, Gordon Beckham, and Justin Smoak, then Kelly could be a real option at #7. Sometimes you have to take a bit of risk in order to reap bigger rewards. There have been quite a few things of note happening in Reds country of late. ** First and foremost, the arrival of Jay Bruce. What more is there to say. He has been acknowledged as the premier prospect in all of baseball and he wasted no time in announcing his presence at the MLB level. It's hard to envision a better debut. Bruce went 3-3 against the Bucs with a double, two walks, and a stolen base. That's kind of debut you hope, but can't realistically expect. Still, anyone who saw Bruce's laser shot triple off the right centerfield wall at Pac Bell Park in the futures game last year knows he's got serious talent. His bat speed is ridiculous and it should be fun watching Bruce dominate the competition for years to come. ** I hate to point this one out, but it does seem relevant. Former Red Josh Hamilton is having a dominant year in Texas and has joined Jay Bruce as the two best stories in all of baseball. Jay Bruce for his electric debut and Josh Hamilton for his amazing triumph over drug addiction. Hamilton currently leads the Triple Crown categories and his talent means that it's not a fluke. There may not be a more talented player in baseball, with the possible exception of that fellow named Alex Rodriguez. As good as Edinson Volquez has been this year, it's hard to swallow the fact that the Reds could have had an outfield of Bruce and Hamilton over the next decade. In all seriousness, there may not be two more talented players in the game today and they could've formed the foundation for the next eight to ten years. Almost regardless of which player the Reds chose to round out the outfield with Jay and Josh, that would've been an outfield of almost unparalleled skill. For me, it's still hard to swallow the fact that we traded Hamilton away. I hated the trade then and I still really dislike it. Edinson has been great, but Bruce and Hamilton are a tandem that could really have taken us places. ** The Reds finally managed to separate the the inseparable. The Reds sent Corey Patterson to the minors, taking away one of Dusty Baker's favorite toys. Whether the Reds realized that Corey wasn't helping the team or just they felt the need to ensure that Dusty would give Jay Bruce the playing time he deserves is largely irrelevant, as the important thing is that the Reds made the right move to improve the team. It's still hard to fathom that we are paying Corey Patterson $3M when no one else even wanted him. I guess the Reds found out the hard way why no one else wanted him. ** Devin Mesoraco has arrived. Given his poor debut in 2007 and his slow start in 2008, I was beginning to get concerned. That said, he has really turned it on for the Dayton Dragons. He is currently hitting .283/.348/.450/.798 and a robust .368 in his last 10 games. Mesoraco is beginning to show the skills that made him the Reds first round draft pick. It is still a long way to the majors, but Mesoraco has taken an important first step. ** The Reds designated Scott Hatteberg for assignment. Hatteberg is a "pro's pro" and a true professional hitter. Unfortunately, as impressive as Scott's approach is at the plate, it can't fully offset his limited power. Accordingly, Scott's tenure with an organization lasts only as long as it takes for that team to find a first baseman with a better upside, then it's time to move on to a new team. Scott deserves a chance to play for a good team, so hopefully the Reds will be able to accommodate him. ** For some odd reason, the Reds aren't giving Paul Janish a chance to play. It really is an odd decision, as this is likely the only chance the Reds will have to get an extended look at him against MLB competition. With Alex Gonzalez and Jeff Keppinger both nursing knee injuries, the Reds could be giving Janish the starts at shortstop to determine if he has a future at the MLB level. Janish has a plus arm and a very good glove at short, so the question will always be his bat. However, he does have very good on base skills, so if he can hit just .265 at the MLB level, then he'd likely have a .350 on base percentage. A shortstop with plus defense and a .350 on base percentage is deserving of consideration for a starting job at the MLB level. However, the Reds don't seem to be interested in finding out what Janish can do, as Dusty continues to trot out once of his personal favorites to play the position: non-shortstop Jerry Hairston Jr. It seems like a missed opportunity in what is shaping up to be another lost season. ** The Reds declined to meet the salary offered to Tom Shearn by the Korean League, so Shearn is now winging his way to Korea to play ball. Shearn really isn't an MLB pitcher, but it's great that he persevered long enough to get at least one summer in MLB. His hard work and never say die attitude earns him a spot in Major League Baseball history and a never-ending series of stories to tell his grandkids. All the best to Tom in his far East excursion. ** Another lackluster performance got him sent down to the minors. At this point, it's difficult to imagine him getting another shot with the Reds, but that's hardly unjustified. Belisle has gotten chance after chance, but never taken advantage of his opportunities. Belisle always appears to be on the cusp of success and his peripherals are always solid, but like several other pitchers around the league his overall performance is worse than his peripherals. Given that, Belisle may actually be the perfect pitcher for the Reds, who annually find the whole of the team to be less than the sum of its individual parts. Maybe Belisle just needs a change of scenery, but his time in Cincinnati should now be at an end. Well, now is as good a time as any to check in on my two favorite Reds prospects, Josh Ravin and Danny Dorn. Josh Ravin was assigned to the low-A Dayton Dragons, where he has already made two starts. 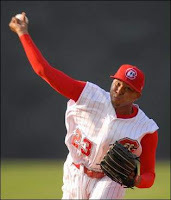 In his first start on May 17th, Ravin faced the Great Lakes Loons. He worked 4.2 innings, allowed 6 hits, 4 earned runs, and posted a 4/2 K/BB ratio. Not great, but not terrible. Ravin struggled mightily last year with his control, so the key indicator for him this year will be his walk rate. Ravin made his second start today and he was pretty impressive. Facing off against West Michigan, Ravin worked 5.1 strong innings. He didn't give up a run, allowed only 3 hits, and posted a strong 4/1 K/BB ratio. All in all, it's a pretty encouraging start. Ravin had serious control problems last year, which ultimately led to him sliding all the way off of Baseball America's Top 30 Prospects List. However, I still like him a lot and rated him at #14 on my prospect list this past offseason. I'm a big believer in the benefits of sabermetrics/statistical analysis in baseball, as it provides a good picture of what is going on. However, I don't think it quite provides the whole picture. In Ravin's case, I think his mechanics are tremendous and when you pair that with his impressive stuff, then I think you have a real chance to develop a special starting pitcher. There is a long road between low-A and the majors, but I'm pretty encouraged by his first two starts at Dayton. As with Josh Ravin, I see a bit more in Danny Dorn than the stats might indicate. Frankly, I think his swing is just about picture perfect. He's got great balance and tempo in his swing, which should translate into quality performance at every professional level. Dorn started off 2008 rather slow, which was a bit disappointing considering how well he performed in 2007. In addition, Dorn struggled through injury and ended up missing a couple of weeks. However, Dorn is beginning to get in the grove for double-A Chattanooga. In his last 10 games, Dorn is hitting .345 with 4 extra base hits and 7 RBI. That streak brought his overall line up to .239/.357/.326/.683. While still not spectacular numbers, they are now heading in the right direction. My impression of Dorn is that he is a pure hitter. While he lacks big power, his on base skills will likely be the determining factor in the type of career he has. I'd love to see him have a strong 2008 campaign and force his way into the Reds plans for 2009, after Dunn and Griffey potentially leave town. Most scouts still project Dorn as a 4th outfielder, but I still think he's got a real chance to be something more than that. His sweet swing could make him a legitimate option in leftfield for the Reds. Well, it's early in the year, but it's not too early to take a look at who's sizzling and who's fizzling on the farm. Todd Frazier - Frazier, a supplemental 1st round pick in last year's draft, has been white hot early this year. He started off at low-A Dayton, but earned a quick promotion by posting a robust line of .321/.402/.598/1.000. He had a 28/15 K/BB ratio and 7 homeruns. He got bumped up to high-A Sarasota, where he has still been holding his own, posting a line of .245/.309/.551/.860. If he keeps producing, he'll continue on the fast track up the developmental ladder. His performance has expectations for him sky-rocketing. For now, he's a very good looking prospect. Justin Turner - Turner, a scrappy middle infielder from Cal State Fullerton, has been going very well in early 2008. He started out at high-A Sarasota, posting a line of .316/.384/.390/.774 in a tough environment for offense. The Reds moved him up the ladder to double-A Chattanooga where he has struggled out of the gate. The jump from A-ball to double-A is widely considered the toughest in professional baseball, but Turner is a smart player who gets the most out of his limited skillset. The early 2008 returns are very positive on Turner. 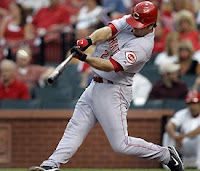 Jay Bruce - The best prospect in baseball and he's proving it again in 2008. The Reds sent him to triple-A to start out year and he's responded by hitting an out-of-this-world .369/.397/.661/1.057 with 10 homers and a 41/11 K/BB ratio. Clearly, he's elite and he's ready, which will make it fun to be a Reds fan for the next decade or so. Darly Thompson - Well, the concern heading into 2008 was whether his velocity would return and those concerns have been laid to rest. Thompson has been pitching at a level typically reserved for the Clayton Kershaws and David Prices of the world. The Reds sent Thompson to double-A Chattanooga and he has responded, to say the least. In 55.1 innings pitched, Thompson has a 1.63 ERA, 0.96 WHIP, and a 49/14 K/BB ratio. His performance level is that of the very best prospects, so it'll be interesting to see if he can sustain it. There was concern that the Reds might not have any impact pitching beyond Cueto and Homer, but Thompson may be part of the next wave of talent. Matt Maloney - Last year, it seemed that Maloney was on the cusp of the big leagues and may even put up a strong battle in spring training to break camp with the team. However, Maloney was sent to triple-A to start the year and has had a very rough go of it in 2008. In 47.2 innings, Maloney posted a lackluster 4.91 ERA, 1.37 WHIP, and a 41/14 K/BB ratio. Maloney has been hit hard, giving up 51 hits, but his K/BB ratio is still stellar and he's likely to get back on track in the near future. Devin Mesoraco - The Reds chose not to assign Mesoraco to a team to start the year, preferring to keep him in extended spring training. However, Devin was recently sent to low-A Dayton, where he has gotten off to a slow start. At Dayton, Mesoraco has posted a line of .182/.270/.364/.634. While it's still early, it would be nice to see some sign of competence at the plate, especially coming on the heels of an uninspiring 2007 campaign. His play has improved as of late and it's far too early to be discouraged by Mesoraco, but he's going to be 20 in June, so it would be nice to see him capable of holding his own against the lowest level of full season competition. Pedro Viola - Viola exploded onto the scene in 2007, posting a 1.42 ERA across three levels of the minors. Unfortunately, his 2008 hasn't exactly been smooth sailing. On the season, Viola is sporting a 6.75 ERA, 1.92 WHIP, and a 22/13 K/BB ratio. Relievers almost always have to be viewed in the context of a smaller sample size, so Viola's numbers should normalize over the next month. He still has very good upside and he should form a potent tandem at the MLB level with Josh Roenicke. Overall, it's been an interesting start to the season and should only get better. Josh Ravin was just assigned to Dayton and Danny Dorn is now back from injury. In addition, Chris Valaika is off to a very strong start and is looking to reestablish himself after a down 2007. Overall, there is joy in Mudville...er....Cincinnati this year. Well, it's time to look back on the Reds latest headscratcher: Firing GM Wayne Krivsky and replacing him with Walt Jocketty. Unfortunately, this represented yet another change for an organization that has undergone far too much of it lately. More than anything, the Reds need stability. With this latest batch of hirings and firings, this organization has now had 4 different managers and 3 different GMs in the last 5 years. The best teams demonstrate tremendous stability in their front office and coaching staff. The Braves, Red Sox, and Twins are good examples. Say what you will about Wayne Krivsky, but what did he do this year to deserve the ax? To me, this is a baffling move. Truly baffling. If you were going to make this move, why not make it over the offseason when Jocketty could have done something to reshape this team? Krivsky certainly had his ups and downs, but taken in total he's performed well in his time in Cincy. However, it's clear that he made some missteps. "The Trade" was and will continue to be beyond terrible. I (still)don't like the Hamilton for Volquez trade and Krivsky had an alarming habit of giving out multiyear deals or just large deals to mediocre veterans (Stanton, Patterson, Castro). Still, Krivsky was leaps and bounds better than O'Brien, who couldn't even pull the trigger to alleviate our 4 outfielder fiasco. Krivsky stole Hamilton and Phillips in very shrewd moves that demonstrated both strong player valuation skills and the willingness/confidence to roll the dice. He locked Harang into an extension and brought in the perpetually underrated Scott Hatteberg. 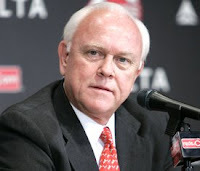 As for Jocketty, I'm not entirely sure what he has done in St.Louis that's so great. He seems to excel at acquiring expensive veteran talent (Rolen from the Phils, Edmonds from the Halos, McGwire from the A's, etc), which is the exact opposite direction from where we need to go. It's hard not to conclude that he got very lucky with Albert Pujols. Maybe he personally saw something in Albert, but if he really knew what he had, then he wouldn't have waited until round 13 to draft him. An alarming aspect of the GM switch is that Jocketty fell out of favor in St. Louis because he couldn't get along with Jeff Luhnow, Cardinal V.P. of scouting and player development, who is one of the new wave of baseball minds who embraces statistical analysis. The Cards showed Jocketty the door and brought in GM John Mozeliak, who embraced the new wave of baseball thought, while we decided to hire the old school guy. I'm not entirely sure we come out ahead in that deal. It just seems like a move that smacks of desperation, when there is really no need to be desperate. Unlike firing a manager, firing a GM is unlikely to spur the team on to better performance. In the case of a change of manager, just the change itself can be enough to change the environment and performance (i.e. Pete MacKanin). For me, it seems like changing GMs at this point in the season would not only lack positive impact, but would in fact have a detrimental effect. Changing an entire GM regime over will inevitably bring about a period of adjustment. People have to get used to a new dynamic and there will inevitably be a reshuffling of employees or at least employment responsibilities. Overall, this just seems like more instability for an organization that has suffered from far too much of it lately. In addition, it's difficult to see what Jocketty brings to the table that Krivsky lacked. However, it did result in some revelations about Krivsky's final days. He's on record as saying that he was told to do what it takes to sign Corey Patterson, but he also stated that Dusty Baker was his choice. Still, it seems that at some point, Krivsky lost some of his independence and the total authority to act on behalf of the club. Unfortunately, this seems like change for nothing more than change's sake. This organization is beyond past the point at which we need to commit to a plan and stick to it. This constant reshuffling of the deck does nothing to help this organization succeed. Consistency and continuity are what drives success. It reminds of the old saying: Do SOMETHING, even if it's wrong. Well, the Reds NEED to stick with a plan, even if it's wrong. By constantly changing course, we never even get to find out if we were on the right path before we conclude that we have taken a wrong turn. A funny thing happened in 2008. Daryl Thompson finally arrived. 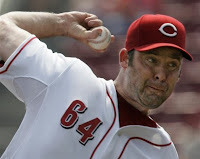 Thompson came over to the Reds in the now infamous Trade with the Washington Nationals. Thompson came over with Billy Bray, Royce Clayton, Brendan Harris, and Gary Majewski for Felipe Lopez, Ryan Wagner, and Austin Kearns. While the Reds will always be losers in that deal, the possible emergence of Thompson could make it a much easier pill to swallow. Thompson stands 6'0" tall, weighs 180 lbs, bats right, and throws right. The Nationals (more specifically, the Expos) selected Thompson in the 8th round of the 2003 draft with the 237th overall pick. 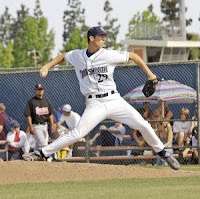 Thompson attended La Plata High School, where he went 5-1 with a 1.30 ERA, struck out 80, walked 15, and allowed only 23 hits in 46.0 innings. To top it off, he posted a solid .370 batting average, proving that he could handle the bat a little bit as well. Thompson has a free and easy delivery, good athleticism, and a quick arm. His arm slot is between an overhand and 3/4 delivery, which gives his fastball good boring action. Even though he had a good feel for pitching and good stuff coming out of high school, his development with the Expos/Nationals was slowed by a shoulder injury. He was still rehabbing the injury when he was dealt to the Reds. In 2007, Thompson actually had a solid season. At high-A ball Sarasota, Thompson posted a 3.77 ERA, 1.30 WHIP, and a 97/31 K/BB ratio in 105.0 innings. While those are fairly impressive numbers, Thompson failed to crack either Baseball America's Top 30 Prospects or my own top 25 Prospect List (he landed in my "Other Notables" section) because of concerns about his velocity. In 2005, Thompson suffered a torn labrum and ended up missing a year and a half of development time. The success rate for surgeries to repair torn labrums is much lower than that of Tommy John surgeries. In addition, all reports on him from 2007 indicated that he had yet to regain his pre-injury stuff. Prior to the injury, Thompson featured a 92-94 mph fastball, an average change-up, and an average curveball that had the potential to be a plus pitch. His curveball has tight rotation and a quick, downward break. In 2007, he struggled to match his former velocity, reaching only 92 at his peak and struggling to sustain his velocity into the later innings. However, Thompson has exploded back onto the scene in 2008. He is now reaching 94 mph again and demonstrating good feel for his curveball. In addition, Mario Soto has once again worked his magic in imparting the secret to an effective change-up and this time Thompson was the beneficiary. Soto has been a tremendous asset to the player development department, as he has had very good success in teaching pitching prospects how to throw the change-up. Thanks in part to Soto, Thompson's change-up has become one of his most effective pitches. In 55.1 innings for double-A Chattanooga, Thompson has posted a 1.63 ERA, 0.96 WHIP, and a stellar 49/14 K/BB ratio. He has been very impressive and it's not luck. He has a .269 BABIP and a 2.45 FIP, so while he is likely to regress a bit from that lofty level of performance, his performance has been just about as good as the numbers indicate. Another thing that helped Thompson's development was facing big leaguers in spring training. He pitched 2.1 innings in spring training and struck out 4 of the 7 hitters he faced, including Hideki Matsui. That experience has given Thompson renewed confidence in his ability to succeed. It's a confidence that he now brings out to the mound with him every time he works. At this point, it'll be very interesting to see how Thompson progresses. He now seems fully recovered from injury and is pitching very, very well. The Reds minor league system has grown by leaps and bounds, but the knock on system has been that it is not very deep. Some scouts have expressed an opinion that there are some impact players like Bruce, Bailey, and Cueto, but not much depth behind the top tier. Some have expressed a belief that the system would fall off after that crop had graduated to the big leagues. However, players like Thompson are stepping up to fill the void and are poised to form the next wave of top prospects in the Cincinnati system. At this point, the future is once again bright for Daryl Thompson, which is very good news for the Reds and fans of the team. If the respective performances of Joey Votto and Edinson Volquez weren't enough to lift your spirits about our last place squad, then it's best to call in Mr.Redlegs to do the job. Obviously, Mr. Redlegs is making the San Diego Chicken proud. Unfortunately, he seems to have forgotten the Rules of Mascots. The First Rule of Mascots is that you do not talk about Mascots!! The Second Rule of Mascots is that you keep your freakin' head on!! Joey's 3 Homers and "Rude Teammates"
Interesting Joey Votto interview (featuring Adam Big Donkey Dunn) with ESPN News. Enjoy!! Great answer about getting into a comfort zone!!! 1) Call it what you want, the big blast, the big bop, the big stroke or simply the big hit, but the Reds must start getting important hits that drive in runs from the guys batting in the Nos. 3, 4 and 5 positions — Ken Griffey Jr., Brandon Phillips and Adam Dunn. Or change the lineup and batting order, even though manager Dusty Baker has tried that and it hasn't worked much. 2) When you pay a guy $46 million, you want to use him. In the first month, closer Francisco Cordero had only four save opportunities and converted all four. The Reds must get themselves in save situations for their big closer, who didn't do much more in April than be a companion/father confessor for fellow Dominican pitchers Edinson Volquez and Johnny Cueto. 3) When Aaron Harang pitches, the Reds must imagine that Volquez is on the mound. Harang was 1-4 in April with a 2.98 earned run average, which means he could go 6-24 and win the ERA title. The offense averages 3.1 runs when Harang pitches and 7.0 when Volquez pitches, including 27 in his last three starts. 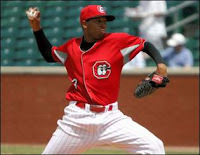 Maybe the Reds can have all starting pitchers wear Volquez's No. 36. 4) Corey Patterson is hitting .214. Ryan Freel is hitting .321. Who should bat leadoff and play center field — even though both seem to need anchors or ankle bracelets when they run the bases? 5) Make trades for Milwaukee's Bill Hall, Houston's Lance Berkman, Chicago's Derek Lee and St. Louis' Rick Ankiel. If they are going to beat you, let them join you. At the plate: The Reds are 10th in the NL in runs (124), eighth in batting average (.256) and on-base percentage (.328). On the mound: Cincinnati's 4.37 ERA ranks 12th in the NL, and the Reds are tied for last with just four saves. Biggest downer: Corey Patterson, batting .214 with a .280 on-base percentage. Best surprise: Edinson Volquez, 4-0, leads NL with 1.23 ERA." Now, I must say, when I saw the title of the article I thought it would be interesting and insightful, but instead McCoy slipped into his Captain Obvious hat and provided nothing that isn't obvious to even those fans at GABP who have had one too many adult libations. Next thing you know, Hal will be telling us that in order to win more ballgames the Reds need to score more runs than the opponent. The longer I follow this game, the more I appreciate good media coverage. I've gained a new appreciation for the lowly Royals, who by some cosmic coincidence have some of the best baseball writers and minds in the game among their fans. The cosmic tumblers somehow all clicked into place to make Bill James, Rob Neyer, Rany Jazayerli, and Joe Posnanski all Kansas City Royal fans, writers, or both. Over the years, the eloquence and insight of these writers have made me really appreciate the Royals. Their ability to make me appreciate the plight of the lowly Royals just reveals the power of the pen, at least when wielded by the right people. Quality media coverage of professional baseball can enlighten and inspire, but lately it seems the Reds have fallen short in that area. Hal McCoy clearly mailed this one in or maybe his editor slapped the wrong headline on the story. If he had been claiming to do nothing but highlight the problems, then it would've been less grating, though no more insightful. On the television side, the fans are left with a broadcast crew anchored by a father and son that seem to compete for the honor of Most Negative Broadcaster. I've sang this song before, but the best broadcasters (The late, great Bill King, Vin Scully, Ernie Harwell, Jack Buck, Jon Miller, etc) are the farthest things from homers, but they manage to keep their criticism both objective and constructive. If a play is bad, then they have no hesitation in saying so, but they never attack the player himself. That's the difference. These players are out there doing their best, so what's the point of consistently criticizing them? I'd like to see the overall quality of media coverage on the Reds improve, but maybe that is a pipe dream in the modern era of journalism, where cut backs are the norm. One wonders how much the public is missing out on due to these cut backs. The media is truly our lens on the world, but lately the Reds fans seem to be left with a lens that focuses only on the negative, attacks players instead of plays, and at times seems to provide nothing of value at all.